Talk about the Travers has shifted to talk about Travers weather. Yesterday, despite a perfectly sunny, late summer morning, everyone, including the local television weather watchers, seemed focused on Hurricane Irene. The turn of events resulted in the installation of a son of Stormy Atlantic named Get Stormy as the gr. 2 Bernard Baruch Stakes’ morning line favorite – his handle the kind of hunch people could easily latch on to at a meet where the study of data’s been fruitless. Public opinion, unfortunately, was not enough to push him across the finish line first. The longshot Turallure, ridden by ace turf jockey Julien Leparoux for trainer Charles Lopresti, won the 1 3/8 mile ninth race. He fanned wide coming out of the far turn and moved on Get Stormy like Obama evacuating the Cape. By the time he reached the 1/16ths pole, he was clear of the leader home free. Sent away at odds of 9-1, Turallure had never won a graded event before but had finished fifth in the gr. 2 Fourstardave Stakes within three lengths of the horse that had won it a month ago. In other action, the stewards made a lot of people unhappy with a disqualification of the first race’s second place finisher. They decided that Deanaallen’skitten bumped My Sunshine Girl enough to warrant sliding her down to fourth and My Sunshine Girl up to third. In winning the third race by a nose over Lucas Brady, Caixa Eletronica was up by a head at the top of the stretch, looking doomed to lose having never gotten the distance before. Yet, Mike Repole’s six-year-old chestnut registered his 15th career victory and second at the Spa course this summer. Too Clever By Half won for trainer Chad Brown in the seventh. Live Oak Plantation’s To Honor and Serve, saddled by Bill Mott, returned to the winner’s circle after the eighth race. It has taken the once highly-regarded Triple Crown candidate nine months to get there. The $575,000 Keeneland September ’09 Sale purchase, a son of Bernardini, appeared to be challenged by a hot pace but stayed. Smokin’ Joe Frazier, the former heavyweight boxing champion, presented a trophy and signed autographs for an enthusiastic crowd outside the jockey’s silks room. Frazier’s presence wasn’t enough to bestow Smokin Hero with the blessing to triumph in the third race. Repole Stable horses ran one-two in that one; only five horses – four betting interests – went postward. Only four horses ran in the sixth race. 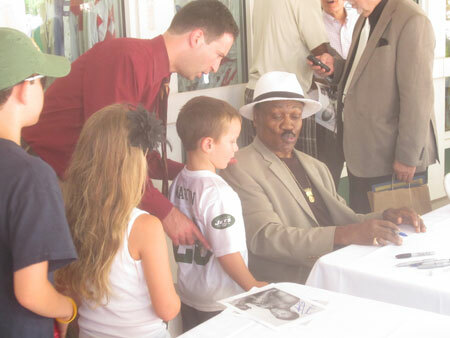 Former World Heavyweight Champion Joe Frazier signing autographs. After the races, about 20 members of a secret tribe of Mohicans gathered at a horse owner’s house on Fifth Avenue for their annual Saratoga feast of firewater and lamb speedies. 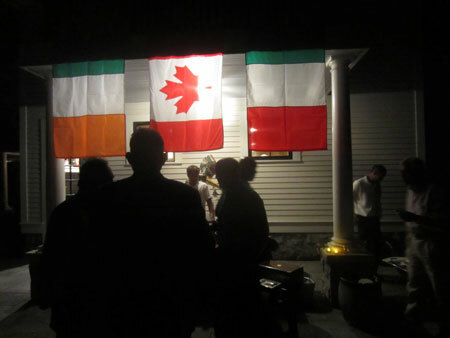 The flags of the USA, Ireland, Canada and Italy flew in honor of their ancestries. The English-born Barbaro author Alex Brown was seen at the Parting Glass at midnight. Secret tribe of Mohicans meets beneath the flags of many countries. 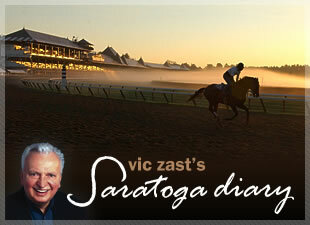 Post time on Travers Day is 11:35 am. Farmer’s Market customers, who buy carrots or apples this week, can drop a few in a designated basket to feed equine residents of Old Friends at Cabin Creek.